If you've been playing Eve for any length of time, you'll probably be familiar with racial damage types. Each of the four races has two damage types associated with it, a primary damage type and a secondary damage type; the primary damage type for Amarr for example is EM, with thermal as secondary. These tend to be the same as the NPC damage types of that race's primary opposing faction (e.g. Caldari racial damage types are the same as the Gurista damage types), and the general principle is that these will be the main damage types which that race will put out in combat. However, that's not necessarily true. The big thing to consider is ammo choice - while both antimatter and iron hybrid charges might deal a mix of kinetic and thermal damage, the ratio between the two is quite different for each. Not only this, but we have to remember that there are only a very small number of ammo types which are regularly used in PVP; 99% of blaster ships will be using either antimatter or null, and a similar thing is true of other weapon systems. Let's start with the simplest of the three. As the main weapons system of the Amarr, we'd expect energy weapons to put out primarily EM damage, with some thermal. This is correct - with the exception of radio crystals (which deal solely EM damage), all energy crystals deal a mix of EM and thermal damage. Two ammunition types (conflagration and gleam, the two close ranged t2 crystals) deal equal portions of EM and thermal, while for all other crystals EM forms the larger portion of their damage. 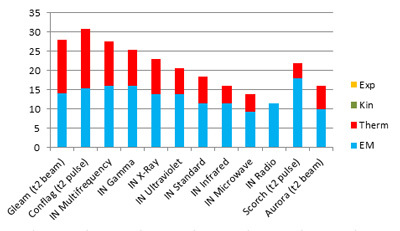 As you can see from the graph, the mix of thermal to EM varies with range - the closer ranged crystals deal equal or almost equal portions of each damage type, while the longer ranged options deliver a smaller proportion of thermal damage when compared to their EM component. The only major exception to this pattern is aurora - the crystal of choice for beam snipers - which deals over a third of its damage in thermal despite being the longest ammo choice available. In PVP, the majority of pilots you encounter will be using navy multifrequency at close range (although conflag has increased slightly in popularity recently), and either scorch or aurora at long range depending on their weapon system. Since energy weapons can switch crystals instantly it's not uncommon for some pilots to also carry a few mid or long ranged faction crystals, especially snipers who want the option of a good long ranged crystal without the tracking penalty of aurora (if they're smart, this is the ammo they'll be using against approaching tacklers etc). The general message here is that EM is indeed the most important damage type to be aware of when fighting energy weapons, but you shouldn't neglect your thermal resist, especially when fighting in close quarters. If either your EM or thermal resist is particularly strong, this may play into the decision between engaging up close and at range, particularly against pulse lasers (e.g. if you have a strong EM resist but weak thermal resist, forcing them to switch to scorch will reduce their damage output far more than the raw damage would suggest). Hybrids are used by both Gallente and Caldari, so it's reasonable to expect a mix of thermal and kinetic damage to be their primary output. While both races make use of the guns, it's fair to say that for the Caldari they are very much a secondary concern whereas for the Gallente they form the race's main weapon system. Since the primary damage type for Gallente is thermal, this leads a lot of people to assume that hybrid weapons deal mainly thermal damage. This is actually wrong! There are only two hybrid ammo types which deal more thermal damage than kinetic - null (long range t2 blaster ammo) and javelin (close range t2 rail ammo). Void (close range t2 blaster ammo) and spike (long range t2 rail ammo) are made up of even proportions of each, while every other hybrid charge deals primarily kinetic damage. Navy antimatter, by far the most used charge for blaster ships, deals around 60% of its damage output as kinetic. Like energy weapons, the ratio of thermal decreases as range increases (at least for the t1/faction charges). However, this is fairly irrelevant for two reasons - firstly because the degree of variation is significantly less than with energy weapons, and secondly it's very rare for anyone to use the longer ranged (non-t2) ammo types (again, with the exception of snipers who will sometimes carry a mid/long range option for improved tracking). For the most part, the only variants that you'll regularly encounter are antimatter, null and spike. So what does this mean for you as an opponent? Firstly, it means that your kinetic resist is going to be very important, especially against blaster ships. A lot of people will mistakenly base their survivability against a blaster ship on their thermal resist, which while important only covers about 40% of the incoming damage. Unlike energy weapons the degree of variation between ammo types is relatively small - even null or javelin deal only marginally more thermal than they do kinetic, so damage output is unlikely to have any bearing on your choice of engagement range. Projectiles are the real wildcard when it comes to ammo types (even missiles tend to be more predictable due to the Caldari racial bonus to kinetic). The primary damage type for Minmatar is explosive with kinetic as secondary, however many of their ammunition choices do not follow this pattern (phased plasma for example has no explosive component at all)! Short range, high damage ammo (emp, phased plasma and fusion). Essentially the same as antimatter charges and multifrequency crystals, but with a selection of damage types. These are by far the most common non-t2 ammo choices. Medium range, high tracking ammo (titanium sabot and depleted uranium). These deal damage equivalent to lead and standard crystals, but come with a fairly substantial tracking bonus making them popular for snipers operating at mid range or attempting to defend against enemy tacklers. Some people also carry this ammo for use when already tackled by a target that they cannot hit. 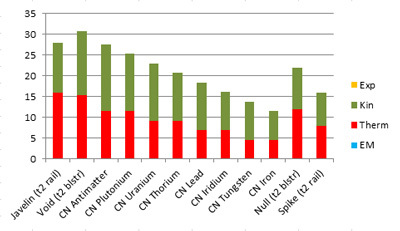 Long range ammo (proton, nuclear and carbonized lead). These are effectively the same as iron charges and radio crystals - long ranged and with low damage. They see some use with snipers who want to avoid temors' tracking penalty. The variety of damage types present in this range is wide - of all the non-t2 ammo choices, only fusion and nuclear follow the expected pattern of majority explosive damage with a smaller kinetic component. Titanium sabot and carbonized lead reverse that pattern by dealing mainly kinetic, emp and proton deal primarily EM damage, while phased plasma deals almost entirely thermal (depleted uranium can't decide, so it just deals a bit of everything aside from EM). So how the hell do we tank against it? To simplify it a little, let's concentrate on the ammo types you're going to face most often - like both other weapon systems, that generally means close range ammo (emp, phased plasma and fusion) and long range t2 (barrage and tremor). The initial reaction (especially with the close range ammo) is probably to notice that none of these ammo types deal a majority of kinetic damage, making it difficult for projectiles to take advantage of a low kinetic resist. However barrage does almost half of its damage as kinetic so leaving a hole there is risky, especially if you plan to engage at range. In the end, the most effective way to tank against projectile damage is to anticipate your opponent's damage selection. This is easier than you'd think - for example, if you're armour tanked then it's relatively likely that your opponent will load fusion if given the choice, so tanking explosive is the natural option. If you're a shield tanker (and particularly if you're a notoriously tough shield tanker like a drake), it's common for projectile ships to load EMP (this is despite the fact that most shield tankers already fit an anti-EM rig, making phased plasma actually a better choice). Similarly if you expect your opponent to kite, they will almost definitely be using barrage which means explosive and kinetic are order of the day. Of course, often a fight will occur where your opponent has had no time to prepare and in these cases they're likely to engage with whatever damage type they already have loaded - the damage loss from a 10 second reload period might simply outweigh any benefit they would receive by changing. In these scenario's your guess is as good as mine, however thankfully Wensley (of Rifter Drifter fame) has a better guess than either of us - he actually took a poll of it (note that the colours don't match up as you'd expect, red is emp not phased plasma). 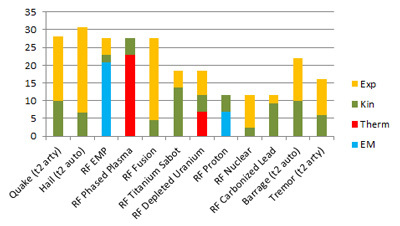 The results are very interesting considering that phased plasma is actually more effective than emp against most of the targets. The only real explanation that I can think of is that prior to the projectile buff (which was over 2 years ago now), emp actually dealt more damage than either phased plasma or fusion and perhaps old habits die hard? Since this poll was taken about a year ago, it's possible that things have changed in the time since. On a related note, Wensley also produced another article* analysing how different projectile ammo types perform against various resist profiles (including base resists with various common hardener combinations, as well as each race's t2 resists). I really recommend giving it a read if you fly projectile ships regularly, there's a great deal of useful information there. * If you notice some similarity between that article and this one, you'd be correct - Wensley's article was the main inspiration for the graphs I've included above! "Use EM for Shield tanks, and use Explosive for Armor tanks." When flying minmatar I like to use Phased Plasma alot too. It's a nice choice if you're unsure of your opponents resists. Of course I also "show info" on the ship as needed to check native resists. Problem with that is people fill those holes up pretty well. For example my drakes highest resist is actually EM for that exact reason. In my experience, EM is the only resist regularly filled on t1 ships. Shield tankers almost never fill thermal, and armour tankers fill explosive only occasionally and rarely kinetic. For t2 ships, it's common to tank your lowest resist whatever it is, especially for gallente/caldari where the hole is noticeable. Amarr t2 armour tankers often tank their second lowest too. I think it would be cool if someone did an analysis of like 1000 loss mails and found the best averaged out damage types. Then damage types for each ship type. etc. When I was active in w-space, intel was the most important weapon in our arsenal (well it usually is, regardless of where). Lesser prepared gangs and people we ganked in anoms usually fell because they didn't have intel on us, whereas we had intel on them. I used to overfill my kinetic hole whenver we'd be surprising some Drakes or Tengus running anoms, while usually loading thermal heavy ammo if possible since the standard fit for a Drake fills the EM hole but not thermal. 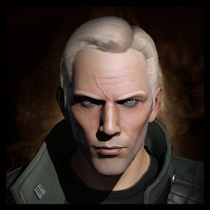 Likewise this one time we said hello to a small gang bashing a POS next door with Amarr BSes, and we either had only one or didn't have any logis, we went heavy on EM/therm resists. I tend to cary RF Phased Plasma, RF Fusion and Barrage - enough for a couple of reloads and that typically covers just about anything. Antimatter and Null are about the only things I see used, and I have not had near as much luck with Hybrids (even with the buff) when compaired to Projectile ships (but that is probaly me more than the weapon system). The 5 second ammo change with Hybrid is nice, which Projectiles would get that buff. @Abbadon21: the problem with looking at lossmails is that your sample is skewed. So, looking at lossmails doesn't help you find the good fits; rather the opposite. Do damage types normally associated as a weakness actually do increased damage, or is it just because of the naturally lower resist? Put another way, does EM actually do more damage to shields than explosive if the resists are the same? Or are resists the only influence on how much damage is received? No, it's just that shields have naturally low EM resist whereas the base EM resist on armour ir relatively high. If your resists were the same for both, the amount of damage you receive would be identical.